Body image is considered to be a high priority on most women’s agenda, it not only represents the way we feel about ourselves, but the way in which we wish other people to view us. There are several factors that contribute to body image, with the main issues concerning weight, skin, dentistry and hair care. There are a number of ways in which we can make ourselves feel better. An effective method is setting goals and working towards them until they are reached. This may be academically, regarding physical fitness, losing excess body weight or even issues such as making someone smile or having a good laugh at least once a day. What ever the goal, reaching your target will improve your self esteem, gain confidence and make you feel generally better about yourself which in turn will have a very beneficial effect on your health and the way in which you project yourself to others. It may be that you have several stones in weight to lose or that you want to have gleaming and gorgeous teeth, but it must take time gradually. It may mean saving up money in order to seek your goal or it may mean gradually losing a few pounds a week for a few months, but it is important not to expect too much of yourself in too short a space of time. Almost every individual will have at least one part of their body that they are not happy or comfortable with. There are very few people who profess to be perfect including celebrities who often appear to have the ideal body, face, hair, smile etc but if you study them carefully you will probably find that they know what their good points are and play them up and know how to draw attention away from their bad points. This may mean that they always stand in the same pose, wear the same style dresses, know how to apply their make-up to narrow a nose, broaden the lips and so on. We could all benefit from applying the same tactics. Ask your friends to tell you which are your best points and which are your worst, then find ways in which to enhance the good. Ask staff in clothes shops which cut or style is most suited to your frame and don’t deviate from it too much unless you change your shape. 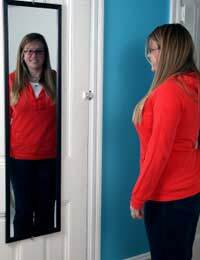 Every parent of a teenager, past or present, will understand how delicate the subject of appearance and body image is and how difficult it can be to address these issues without causing upset or distress.Always try and speak to your teen like an adult, asking their opinion and meeting them half way with a compromise. If you don’t like their new piercing or tattoo, there is little you can do except let them know you disapprove or don’t like it. Most teenagers do not respond well to opposition or confrontation and will only act in rebellion to this. Try and re-enforce the good parts of their image with compliments or gently suggest how they might improve something. Use careful terminology that backs up the good points and doesn’t make an issue out of the bad. Praise their talents and achievements and let them know how proud you are of them but be careful not to make too big an issue of their weaker points; this will only serve to shatter their self-confidence and will affect the way in which they and others view themselves. Body image is a complex issue that some people feel fairly good about whilst others seem to struggle their whole life with. It is not just about how you look, but how you project yourself, the impression you leave on others and how happy you are inside. All these issue help to shape the people we are and contribute to how we appear to others and feel about ourselves.